The story soon gets going with a Mexican stand-off reminiscent of an over-blown Quentin Tarantino set-piece scene and we are then taken on a non-stop gallop through the annals of Wild-West folk-lore and Hollywoodâ€™s best moments in depicting the West as we meet Injunâ€™ outcast Painted Crow, Eli Jones (who can only talk in the third person), Shooter Sue, Sam the Prospector, Lilâ€™ Jimmy, the bartender (naturally) and around another thirty or so characters from every walk of life in what is arguably the most consistently popular movie genre of all time. Westernised could be described as a loving homage to the romance and adventure of the West. It is also be said to be a totally off-the-wall satire, never for a moment taking itself seriously and delivering comedy, absurdity and silliness in ways of which The Goodies would be proud and Spike Milligan would heartily approve. By comparison, â€˜Blazing Saddlesâ€™ is a serious historical narrative and â€˜Carry on Cowboyâ€™ a docu-drama. The comedy keeps coming over in the form of the purely visual gag, the throw-away pun, quick-fire character changes and songs. The original music is written in authentic Western style in the same way Neil Inness captured medieval-sounding ballads for â€˜Monty Python and the Holy Grailâ€™ and the frequent interjections of steel-strung guitar add both depth and authenticity to this comedy roller-coaster. There are also interesting additions of physical theatre. The only scene which appeared to drag a little was one involving three mirrors but the pace is otherwise consistently fast, furious and funny. 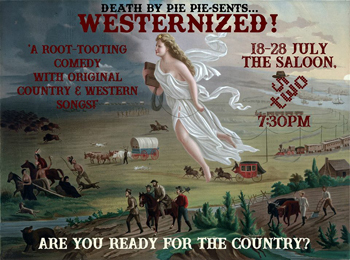 Westernised is the third satire/farce performed by Death by Pie, written by Nathan Smith and, for me at any rate, is the best and most rounded of the three, with no disrespect to either â€˜Health under Fireâ€™or â€˜House on Hallowed Hillâ€™. It is also an object lesson of just what can be achieved on a miniscule budget if you have the talent and versatility of a dedicated cast and creative writer. Death by Pie is now quite an established working ensemble who clearly spark well off each, delivering a seamless, sophisticated show. The mix is also well balance with Nathan Smith acting as a lynchpin akin to a theatre version of Harry Enfield but make no mistake, Death by Pie is a true ensemble. Dan Brazier leads the comedy with staring eyes worthy of Marty Feldman and is ably assisted James Beglin who makes his own the kind of secondary roles which the likes of Peter Butterworth did so well in the Carry On films. Scott Hodgson is unquestionably the straight man and the straight-playing of most of his characters provides the perfect foil for the rest of the cast to Spark off; where would Eric have been without Ernie? Both Roisin McCusker and Hannah Hobley demonstrated considerably versatility in playing male and female roles, both young and old and it must be said that Roisin in ways not dissimilar to Scott, brought forth a lot of comedy by â€˜playing it straightâ€™ so heightening the absurdity of other characters. Westernised is different and very much a fun night out and runs in the marque outside 53 Two until 28th July.